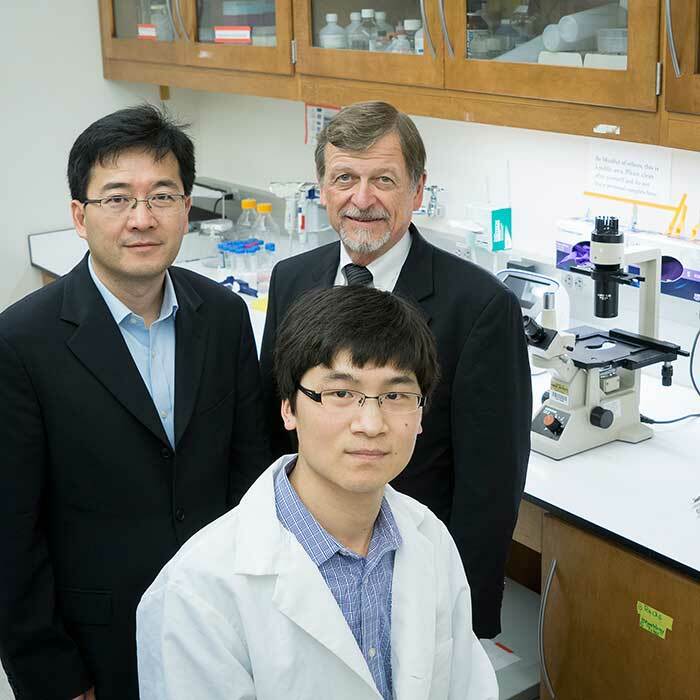 A Purdue-related biomedical startup company co-founded by Dr. Timothy Ratliff, Purdue Veterinary Medicine distinguished professor of comparative pathobiology, has developed a new therapeutic strategy for late-stage prostate cancer that could provide an alternative to current hormone therapies, which are known to develop resistance after prolonged use. The company, Resarci Therapeutics, is using a Purdue University technology licensed through the Purdue Research Foundation Office of Technology Commercialization. Dr. Ratliff, who also serves as the Robert Wallace Miller Director of the Purdue University Center for Cancer Research, co-founded Resarci Therapeutics in 2015 with Dr. Ji-Xin Cheng, a professor in the Weldon School of Biomedical Engineering and Department of Chemistry, and Dr. Junjie Li, a post-doc research fellow in biomedical engineering, with the goal of making better therapies for cancer patients. Dr. Cheng said that resistance to current hormone therapies is one of the biggest challenges patients face in treatment. "Hormone therapies have a goal to reduce male hormones, called androgens, in the body, or to stop them from affecting prostate cancer cells," he said. "Almost 100 percent of cancer patients will eventually develop a resistance to hormone therapies. Every year in the United States around 32,000 new cancer cases become resistant, lessening the likelihood of survival." The new therapeutic strategy developed by Resarci Therapeutics targets the cholesterol metabolism instead of the androgen pathway. "By targeting the cholesterol metabolism, which is specific to cancer cells and independent of the hormone signaling pathway, we are able to eliminate the hormone resistance," Dr. Li said. "We target the aberrant cholesterol metabolism using an inhibitor of cholesterol esterification enzyme ACAT-1, named avasimibe. Avasimibe selectively kills cancer cells by preventing the cholesteryl ester accumulation and inducing free cholesterol related toxicity in cancer cells." Dr. Ratliff said the company has demonstrated the ability of the inhibitor avasimibe to overcome the resistance to hormone therapy in mouse models and is looking to further improve their product in future trials. "We want to improve the formulation of our product, test it in preclinical settings and launch an early-stage clinical trial," he said. "We are applying for funding from NIH and other agencies, but are also looking for investors or potential partnerships with pharmaceutical companies." Resarci Therapeutics is a client of Purdue Foundry, an entrepreneurship and commercialization accelerator located on the Purdue campus, and was a recipient of the Elevate Purdue Foundry Fund First-tier Black Awards receiving $20,000. Click here to view a video about Resarci Therapeutics LLC, which includes comments by Dr. Ratliff.